A disc filter consists of a stack of discs, each with a series of microscopic grooves. The dimension of the grooves determines the effective mesh size of the filter, ranging from 40 to 600 mesh. Water is filtered as it flows through the grooves. Most disc filters must be cleaned manually by separating the discs and reversing the water flow through them, but automatic backflush types are available. 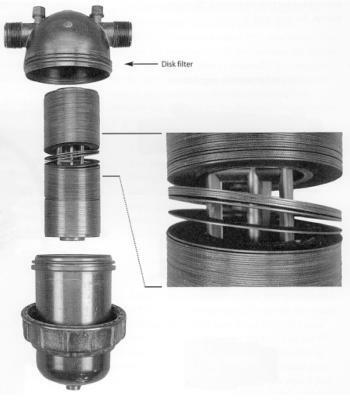 A disc filter requires less water volume for backflushing than does a sand media filter; one manufacturer specifies a backflushing flow rate of 9 to 18 gallons per minute for each filter cannister. Multiple cannister filter units are available to accommodate larger system flow rates. A separate booster pump may be required to accommodate the recommended backflushing pressure. 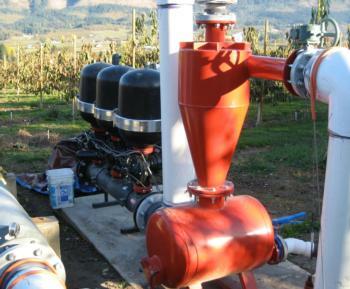 Most of these automatic disc filters only require about 10 seconds for backflushing, whereas the typical sand media filter needs 60 to 90 seconds per cycle. The disc filter is sometimes promoted as an alternative to a sand media filter for filtering organic matter such as algae. Research has shown that while a disc filter may be effective at removing organic matter, it tends to clog more rapidly than a sand media filter. For this reason, only a disc filter system with an automatic backflushing capability should be used as an alternative to a sand media filter.